Under GM Jeff Luhnow, the Astros have focused on rebuilding around second baseman Jose Altuve. The club is beginning to pivot back towards contention. They have enough veteran talent to hang around the edges of the Wild Card race. It will be hard for them to oust the Angels, Mariners, and A's in the AL West, but it's not an entirely outlandish proposition. The roster has its bright spots, but the depth is questionable. The club acquired several veterans over the offseason including Evan Gattis, Jed Lowrie, Colby Rasmus, and Luis Valbuena. They should combine to ensure a relatively high floor in 2015. The rotation is a weakness, but there should be enough depth to make it through a season. Our first couple looks at McHugh came during the 2012 and 2013 seasons. It was ugly. High ERAs, home runs by the bushel, and few outs left McHugh without a role. The Astros saw a glimmer of hope and acquired him. They performed a makeover, teaching him to thrive on his high fastball. The result was a 2.73 ERA, 9.14 K/9, and 2.39 BB/9. He threw more breaking balls than fastballs, which hints at some latent injury risk. The overall profile looks sustainable. He should be able to maintain a low-3's ERA with solid supporting stats. Between the sheer depth of starting pitchers and the surprise breakout, fantasy owners are hesitant to select him. He's the 50th pitcher selected in NFBC – 200th overall. I condone taking him ahead of Yordano Ventura. He's the 30th pitcher on the board. Keuchel has learned to keep the ball on the ground while chasing strikeouts with his slider. He's the kind of guy who is better in reality than fantasy – kind of like Tim Hudson. There's no reason he can't repeat something like his 6.57 K/9, 2.16 BB/9, and 2.93 ERA from last season. Projection systems see a cloudier picture, but they don't recognize the breakout that occurred in late 2013. The overall outlook is a back end fantasy starter. You'll need an elite strikeout reliever to help compensate for Keuchel. The remainder of the rotation is likely to be some combination of Brett Oberholtzer, Brad Peacock, Dan Straily, or Roberto Hernandez. Oberholtzer is probably the best positioned, but he's uninteresting for fantasy owners. Perhaps you could try a rare spot start against a predominantly left-handed lineup. Similarly, Hernandez is nothing more than a spot start option against a righty-heavy squad. Peacock and Straily have both flashed something worth noticing. Peacock uses a four pitch mix. None of his pitches standout, but they're all average. Command and control are the twin banes of Peacock. If he can just tighten up the walk rate, he could be a useful backend fantasy option. Straily is a soft tossing righty with a sub-90 mph fastball. His four-seamer and sinker are both decent pitches, but it's his changeup and slider that really thrive. Despite a complete repertoire, Straily has yet to put it all together. There is a chance of a breakout. Even then, we're looking at around a 3.50 ERA with average fantasy numbers. He's a guy to monitor on the waiver wire – nothing more. The Astros tried to acquire Andrew Miller this offseason. They even (reportedly) made a comparable offer to that of the Yankees. But Miller didn't buy into the Astros as a contender. Plan B involved acquiring two relievers for less than the cost of Miller. Gregerson is the presumed closer, although there has been no official announcement. It's possible the club will stick with Qualls, try Neshek, or even go with Josh Fields. However, I doubt Houston would have committed $18.5 million to Gregerson if they didn't view him as option number one. The righty is a slider specialist. He uses the pitch between 40 and 50 percent of the time. As we've discussed in past team outlooks, a high volume of sliders can increase injury risk. His fastball sits at just 89 mph. He gets away with it due to all those wipeout sliders. Last year, he posted a 2.12 ERA with 7.34 K/9 and 1.87 BB/9. Expect a few more strikeouts (career 8.82 K/9) and a slightly weaker ERA (career 2.75 ERA). Qualls is a ground ball pitcher who performed well in 2014 – at least when he wasn't facing the Athletics. He blew five saves against the Astros' intradivision rival. Most seasons, Qualls has pitched quite well. He also has a few stinkers in the rearview including a 7.32 ERA in 2010 and a 5.33 ERA in 2012. So long as he's sharp, he's a viable closer candidate. Neshek broke out last season as a 33-year-old. As a sidewinding fly ball pitcher with a history of platoon issues, I'm staying away. Houston possesses a solid lineup top to bottom. With batting champion Jose Altuve setting the table for George Springer, Chris Carter, and Gattis, the club should easily improve upon the 629 runs scored last season. The offense will be fueled by power, but there are some concerns to consider. The heart of the order is right-handed and very strikeout heavy. That could leave them exposed against top power relievers. Carter and Springer are both expected to strike out over 30 percent of the time. Gattis comes with a strikeout rate in the mid-20s. If Jonathan Singleton and Colby Rasmus also receive regular work, we could see a lot of free outs from this lineup. The most fascinating hitter on the club is Springer. The NFBC crowd is selecting him as the 15th outfielder off the board – between Starling Marte and Matt Kemp. Projection systems peg him to perform around .237/.330/.460 with 30 home runs and 15 stolen bases. That's huge four category value, and a .237 average doesn't hurt as much as in the past. We've seen the power play at the major league level, but his base running has yet to translate. It's possible he'll continue his restrained approach on the base paths. With such great expected production, it's easy to imagine how he could edge into the top 10 this season. His floor looks similar to Rasmus, so buyer beware. Springer is about as high risk, high reward as they come. If you're looking for some sneaky value, take a gander at Luis Valbuena. The third baseman has some position flexibility and could bat near the top of the order. He hit .249/.341/.435 last season with 16 home runs. While he's not a high average guy, he works his way on base. He could score a lot of runs if he hits second. There's no guarantee it will happen, but we're talking about a guy who is being selected 365th overall. He's “competing" with Matt Dominguez, but that looks like a formality. 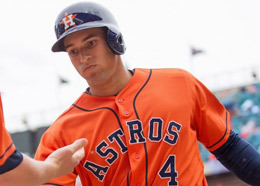 As the 24th team in our power rankings, the Astros are finally prepared to turn the corner. This season appears to be a quest to .500, although they have the necessary talent to float around the edges of contention. The rotation is thin, but it's in much better shape than this time last year. If they can scrape up another breakout like McHugh, they might even be a true force in the AL West. When they make contact, the offense will crush it.